An infographic is a visual representation of information that uses image patterns to help readers see how pieces of information relate to each other. 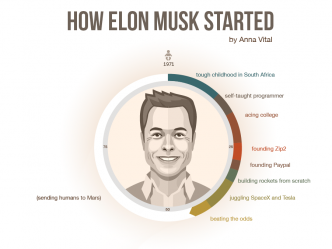 Infographics work by encouraging visual comparison. Infographics exist because we recognize visual patterns faster than we read text. In short, infographics are fast, text is slow. Why? We scan text sequentially. One word at a time. We scan pictures in different places at the same time. You have a natural ability to do this. 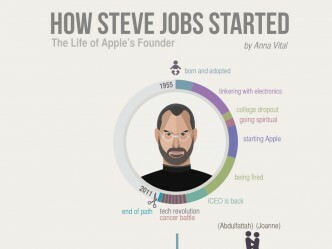 To start our discussion, first, it makes sense to de-mystify infographics. 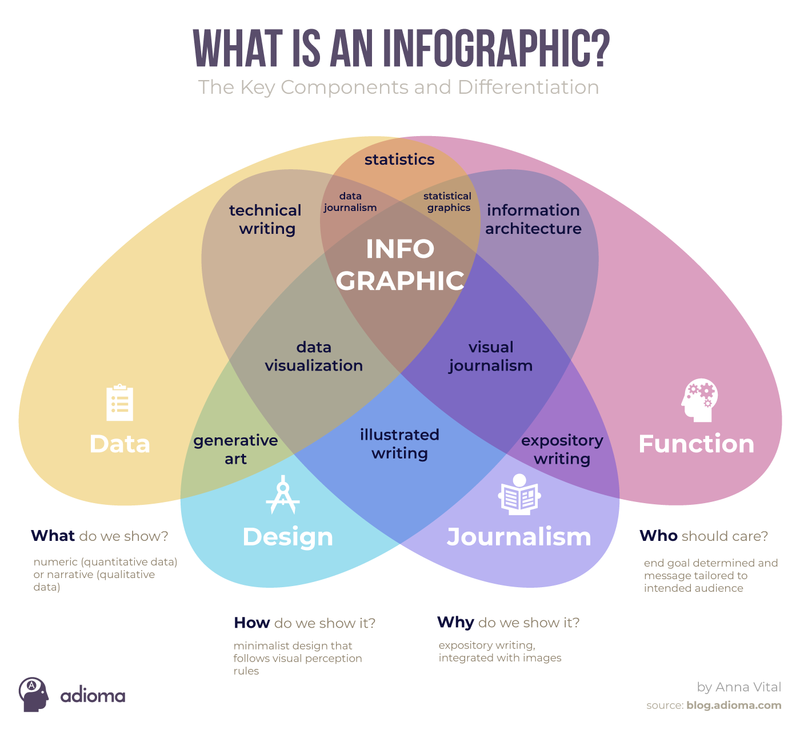 So what is an infographic? It is just a map. Infographics are rich maps for information in general. 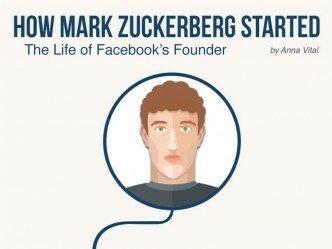 So “infographic” is simply a new name for an old thing. Why invent a new name? Because there is something special about now: we are looking at mountains of new data with no radically new tools to make sense of it. 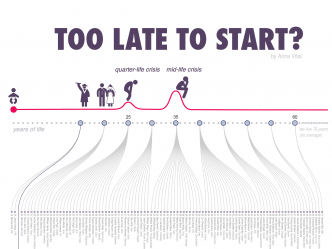 Infographics are our tool to deal with complexity. This is a different challenge than maps used to solve describing the world as it is. The word “infographic” first started appearing consistently in the 1960s. Since then we have not reached complete agreement on what infographics are. Here is what most people agree on: that infographics are some combination of data and design. By “data”, I mean both numbers and facts. This definition is incomplete, though. A more important part is missing here. It is not obvious because it is transparent. This transparent thing is what makes infographics work. That is work better than any other type of pictures for understanding complexity. Let me give you an example. The subway map. At first, it seems like nothing special. We look, we ride. We take the subway map for granted. And this is what makes it so genius: no matter which country you are from, your language, age, or background, we all understand it the same way. Whether you go to Hong Kong, or Tokyo, or Kiev you will use the same map as the rest. This almost never happens between people. When is the last time you met a stranger and she understood you perfectly? Exactly. You might be thinking, “That’s a pretty obvious design… how else would you design it?” Bingo. It means the map succeeded in showing you information without you noticing how it did it. You saw the substance without seeing the form. A transparent design shows you the information, not the design. This is the hidden power of infographics. And this is something we rarely experience in visual communication. Yes, the irony is that as a designer the best design I can do is the one you will not notice. And it is not that you would ignore this kind of design. There is nothing to ignore about it either. It just looks so matter-of-fact, so self-effacing that you would not think to pay attention to it. Speaking of attention, we all run into this problem. Remember the last time you argued with someone? You probably tried to explain your point. But instead of listening to what you were saying, they focused on how you said it. They might have picked a word out of context, or they took issue with your tone or complained that you said it too loud. When this happens to me, I wish I was a subway map which brings me to the big problem all of us are trying to solve with infographics: the problem of human communication. The world runs on communication. Without communication, we would all die. Surprisingly, communication itself is an unsolved problem. Here is the problem: to send a message to another person, you need to communicate it both clear and fast. This puts us in a double bind: if we explain it fast, it will not be clear; if we make it clear, it will not be fast. So the trillion-dollar solution to the communication problem is finding a shortcut to clarity and speed at the same time. We have a record of bouncing between being either clear or fast but not both. Fast communication comes through emotions and senses, like seeing pictures, for example. Clear communication comes through logic and language. You might be thinking, “What if we used both at the same time?” Poets can deliver emotions fast. Laywers can give you clarity if you listen for a while. So then, do we become poetical lawyers? Or lawyerly poets? Sadly, “emotional logic” and “logical emotions” negate each other leading to complete confusion. Then the real question is: how do we use both logic and emotion, both text and picture, both data and narrative without making each lose its meaning? In the beginning, we were sitting in caves and wanting to talk to each other. Words were hard to come by so we invented drawing. We drew a bull on a cave wall. This was fast communication. Except, what did it mean? Everyone in the cave had a different take on the bull. Some thought it was “the bull I ate for the dinner”; others thought it meant “Danger, bull in this area.” Then we came up with a brilliant idea – all of us can agree on what the picture of the bull meant. We also agreed on exactly how to draw it. We standardized the bull picture. That was a breakthrough – we invented writing! And then, before we died, we told our kids to keep drawing the bull the same way. Our kids were sad when we died. Actually, death has always been our biggest problem. Eventually, kids of their kids who became the Pharaohs of Egypt found a way around death. Sort of. The afterlife, it turns out, is a place from which you can come back. But only if you have a map. So they designed a map and put it right on top of the tomb – it showed the specifics about who you were during your life. In one page, we learned to show the whole life of a person! At some point, not just the Pharaohs and gods wanted to write. A poor upstart nation, the Phoenicians saw the power of written language when they met the Egyptians in the markets of Babylon. But they had no time or money to learn thousands of Egyptian pictographs. Instead, they made a quick poor man’s version stripped down to only twenty-two almost random marks. The alphabet was born! Their writing was clear but slow. They ended up needing thousands of letters to say anything important. Now we were communicating clearly but slowly. In the meantime, one of our favorite pastimes was war. We fought to get land from neighbors. Once a war ended, someone had to draw the new borders. We couldn’t solve this by just drawing bulls or just writing letters. Again, we came up with a solution – draw the land, draw bulls on top, and write letters next to them – all on the same page. We invented maps. Now any king could order a map. The world was big and flat and we felt we could draw the map any way we wanted. It was year 267 BC when a Greek named Eratosthenes said he figured out how big the world actually was. He called this a scientific fact because you could redo his math and get the same result. Based on his calculation, he showed the whole world in a single page. We now had the first scientific map. Scientific, but still wrong. It would take us another 1,700 years to find out that the world was much bigger than Europe and Asia. Some brave men sailed off the map and found more continents. One such traveler from Portugal Diogo Ribeiro drew up the first world map based on real data. That was the year 1529. Just as you reach the end of the world, it has a funny way of expanding. Only 80 years later, an Italian named Galileo Galilei started mapping outside of this world altogether. Looking in his self-made telescope, he painted the first map of the Moon from different angles in a single page. Not that Galileo was an artist. In fact, none of the people you will meet in this article were. They all were trying to communicate a message using pictures where words were not enough. And this is where we got our first infographics. Any artist will tell you that it is easier to draw what you can see than what you have to imagine. So how about communicating what you cannot see? Productivity, love, and inflation, for example, are all invisible. The temperature outside was also invisible to an English boy named William Playfair. Every morning he marked on paper the thermometer readings with his brother. The marks were nothing special until one day Playfair connected them with a line. The line showed dramatic changes from winter to summer. By 1786, he thought of the brilliant idea – that anything under the sun can be shown as a line, a rectangle, or a circle proportional to its size. The line chart, the bar chart, and the pie chart were born. 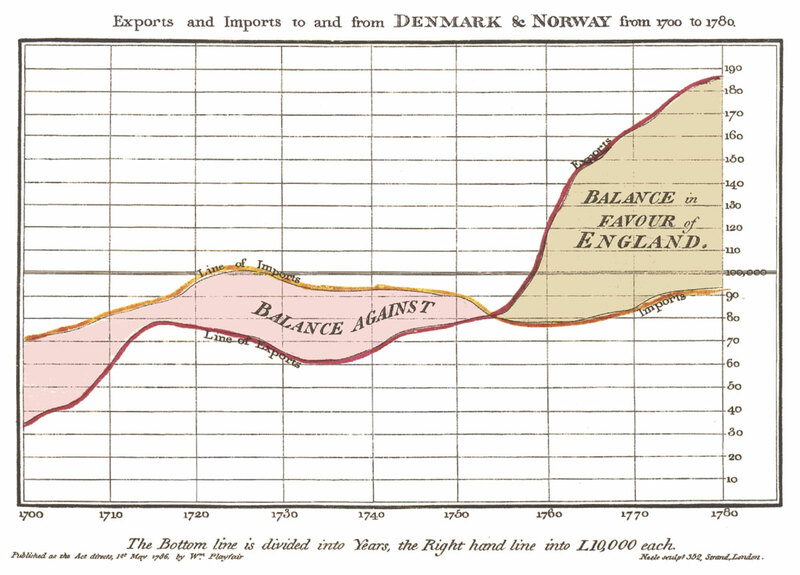 Playfair’s contemporaries thought that charts and pictures, in general, don’t help explain anything. They pointed out that the lines and bars had nothing to do with what they supposedly showed. (It also didn’t help that Playfair was a fraudster and a blackmailer among his many other activities.) The intellectuals of the day all agreed that visualization is showing the obvious to the ignorant. How far we have come! Today Playfair’s charts are the standard for showing serious statistical data. 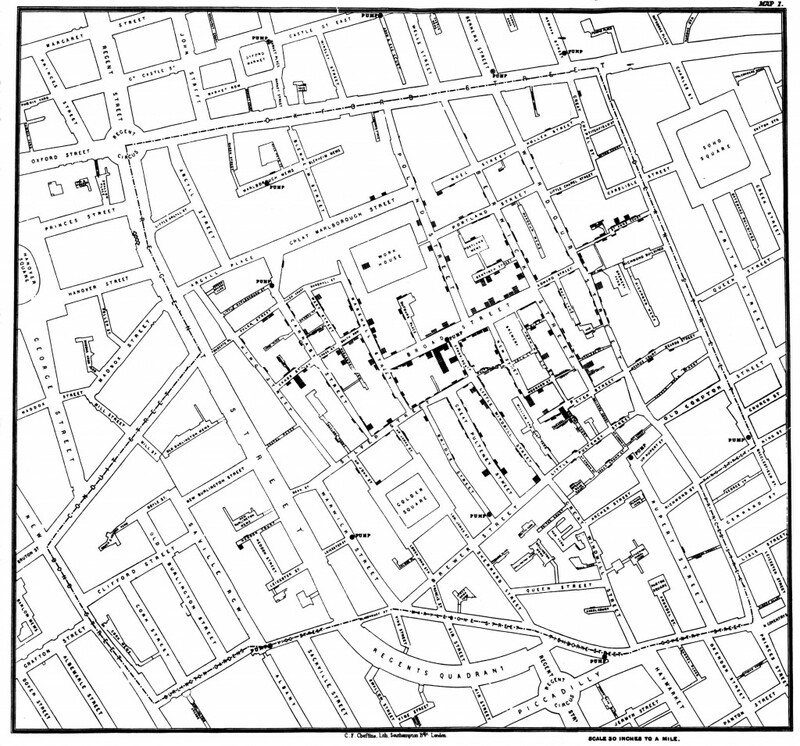 It was the year 1854 when for no apparent reason, a disease was killing people in London. Not everywhere in London, but only on certain streets. One street would see a lot of people die, but neighbors on the next street over were perfectly fine. Looking at the map of London, a physician named John Snow wanted to find a connection between the streets and the deaths from cholera. Using Playfair’s method, he charted the deaths on one page. Then he looked at the map. Why not put the chart right on top of the map? That’s what he did. Then he added another layer – the location of water pumps. And this is where he found his answer. One particular water pump sat right next to the street with the most cholera deaths. We now learned to show many layers of information in one page. Ok, if you can show three layers, then why not show one hundred? Maybe we can layer information indefinitely. Maybe we finally found the answer to the communication problem? In the history of communication, there is one image that stands out for how much it shows in a single page. Fast and clear, French engineer Charles Minard shows us how the largest army ever assembled by that point in history perished. Napoleon leads half a million soldiers to invade Russia. Only a quarter reach Moscow. Only 10,000 come back home. In one page we see seven layers of numbers spelling out the tragedy: the number of soldiers, the major battles, the rivers they cross, the towns they reach, their direction, the dates, and the frigid temperatures. The thickness of the gold line is men going to Moscow, the black is men returning. The tragedy of a whole war told in one page: of 422,000 men only 10,000 returned. Wait, but there are no people in Minard’s chart! How can we show a human tragedy without showing the people? If you didn’t read the text next to the diagram, you would never know that we are talking about real people and real deaths. This problem bothered another philosopher in Austria, Otto Neurath (1882–1945), who wanted to show physically what the numbers meant. His goal was to make statistics interesting to the masses. If we are talking about people, we should show people. For this, Neurath went all the way back to the beginning of this story and borrowed Egyptian pictographs. Stacking them next to each other showed numbers more physically than Playfair’s abstract bar charts. Neurath invented a pictographic language he called Isotype. What if you wanted to show something so complicated that you could not translate it into simple pictographs? 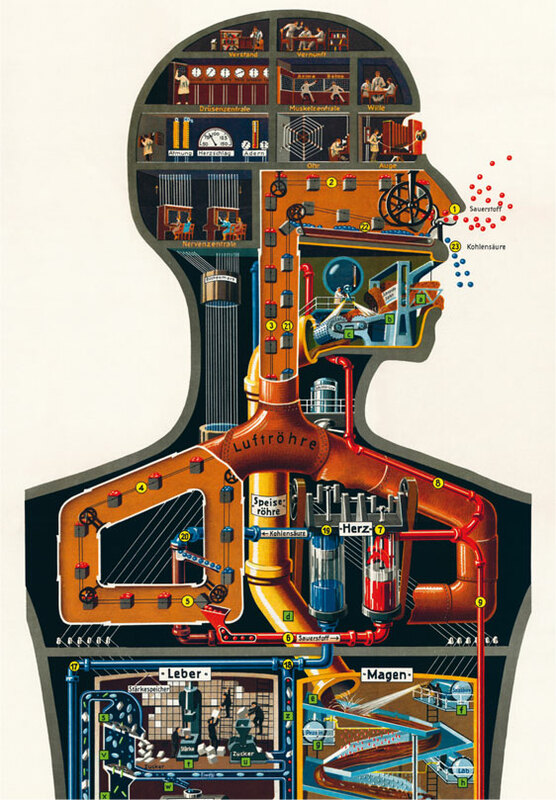 This question brings us to the man who is considered the grandfather of modern infographics, German doctor Fritz Kahn (1888–1968). He wanted to explain medicine to people who knew nothing about medicine. How? He thought up imagination-rich analogies. A person is like a factory. An ear is like a car. The food you eat in your lifetime is like a freight train going to your mouth. These images are so surprising that they are hard to forget. Most importantly, we now learned how to say more by using what we already know through analogy. This last invention is quite different from the earlier ones. Analogy gives us a way to explain anything, no matter how abstract or complex. This is the what makes infographics a universal solution to the communication problem. Remember how we were looking for a shortcut to speed and clarity at the same time? We likely found it in showing information by analogy. So what is an infographic today? Most people today experience it is a pre-generated infographic template with graphs, connectors, and icons. Most infographic tools help to create infographics, but not to make sense of the message inside them. The frontier is now in making meaningful infographics. What is meaningful? Truthful, useful, and entertaining, preferably at the same time. The top authority on visual statistics, Edward Tufte, gives us the principles of truthfulness. Information architect Richard Saul Wurman shows us how to make information useful. Graphic designers like Nigel Holmes and David McCandless show us how to make information fun. So did we solve the billion-dollar problem? We are likely on the brink of it now. It is still day one for infographics. By now we know that the way to solve the problem is somewhere between the two extremes. On the one side is the technical abstract charts invented by Playfair and promoted by Tufte and on the other is the human-centric subjective storytelling through analogy shown by Otto Neurath and Fritz Kahn. Now that you know the story, we can dig into the field of infographics today. You will notice that the infographic still struggles to differentiate itself from its relatives: data visualization, data journalism, and visual journalism. Knowing that all these children are of the same mother should make the definitions less confusing. 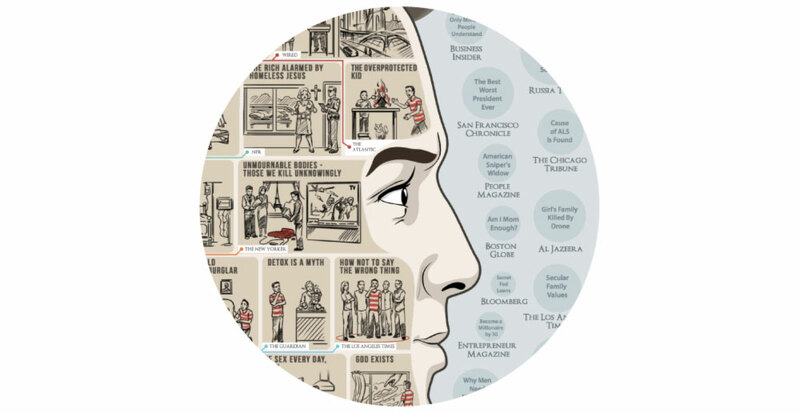 The origin of the word “infographic” is a blend of “information” and “graphic” that first appeared consistently in English language books around the 1960s. The term information graphic appeared slightly before it. 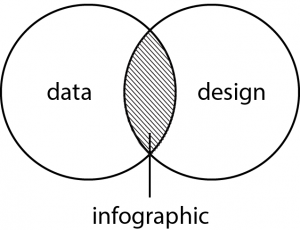 Today “information graphic”, “infographic”, and its shorter form “infograph” all refer to the same thing. Information is what is shown, the design is how it is shown, journalism is why it is shown, and the function is who it is shown to. 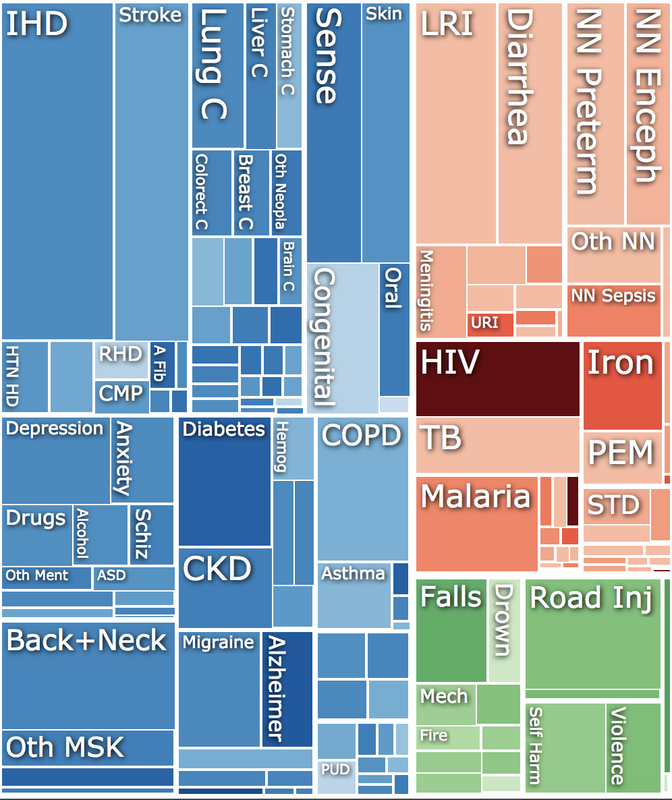 How is an infographic different from its related fields? If we look at the intersections of these related fields, we can discover infographic’s relatives. You only understand something relative to something you already understand. Since infographics show both quantitative data (statistics) and qualitative data (knowledge), we should not be surprised that there is a war of definitions. In the field of statistics, Edward Tufte, a former Yale statistics professor, is widely considered as the most authoritative figure. Although he does not use the word “infographic”, he sets out the rules for a “graphical display”, a term that includes infographics. On the other side of the spectrum is the work of Otto Neurath, who believed visual language should look like what it means. Comparing the work of the two suggests that neither one prevailed, and the definition of an infographic today sits in between theirs. The definition of the word “infographic” diluted around 2010 which coincides with its rise in Google searches. With new interest from advertisers, infographics have come to mean almost any image and text combination. 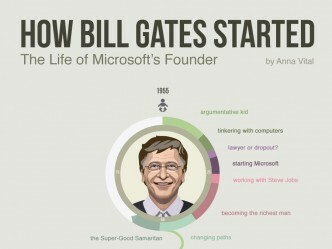 Before this dilution happened, infographics generally lived up to a higher standard. Charts and diagrams. This is the most abstract kind that uses known chart types. Abstract analogies. These infographics use a well-known visual template, like a subway map, to explain something else. For example, the subway map of human psychology. Analogies and allegories. Here the objects are more complex than in the second type. Separately, my team and I created a large catalog of types of graphs and charts organized by their popularity. Infographics are not synonymous with data visualization. An infographic can contain one or more data visualizations. The presence of a narrative tailored to an audience is what differentiates an infographic from a data visualization. Put differently, data visualization shows uninterpreted facts and infographics showing facts with interpretation. So then, data visualization shows objective but less relatable information. Infographics show subjective and relatable narrative. Comparing a data visualization and an infographic on a similar topic, we can see that infographics have a unified narrative and data visualizations show facts separately from each other. In infographics facts are related; in data visualizations facts are discreet. Here is a real-world example of a data visualization and an infographic made from the same data set (only the year is different). In the infographic on the right the designer focused on the data and added little decoration which makes this a good example to compare with a data visualization. The infographic offers plenty of empty space for us to notice the insights. For example, we see that if cancer were a single disease, it would be the biggest killer. Another insight is on the lower left: we often blame wars for humanity’s problems but war only accounts for 0.05% of life years lost today. To an expert epidemiologist, these insights might be redundant, though. The data visualization of the left is still more objective. Infographics work by triggering our visual perception to process images efficiently. Not any kind of image triggers visual perception in the intended way, though. Some types of images backfire, in fact. Overuse of color, for example, can make an infographic unreadable. The desire to fill the empty space, which is a common psychological tendency, leads to the message of an infographic getting lost. There are many ways to abuse infographic design. Some of them are quite common. This topic is big enough that I will explain it in a separate upcoming article. Unconscious inference tells us that people will make assumptions and conclusions about your infographic from incomplete data, based on their previous experiences. Think about what your audience already knows and who they are. They will project their own self onto anything you show them. If there is a conflict, it will lead to confusion. 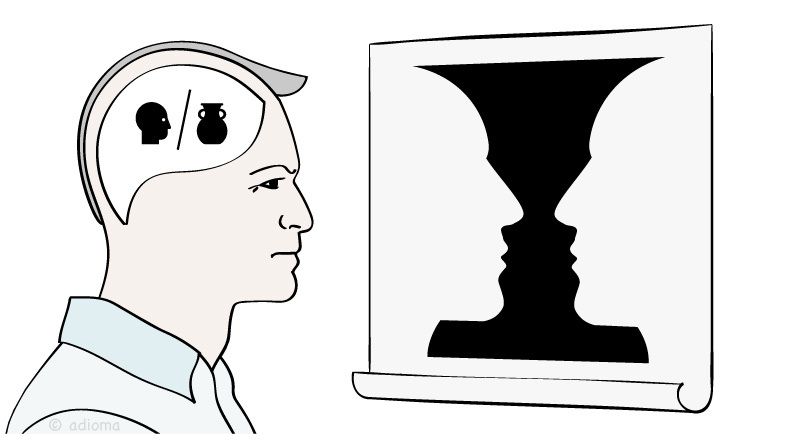 Perceptual constancy is our bias in favor of seeing things as if they don’t change. An example of this is people looking at eggs in a room with a red light and still thinking they are seeing white eggs. In fact, the eggs appear pink or red. But a person knows that eggs are white and overrides the information coming from the eyes with information from the brain. We have many kinds of this bias towards colors, shapes, lighting, distance, and even people. If you ever mistook someone for another person because you saw them in an unexpected place, you experienced perceptual constancy. People look at your infographics will look for the white eggs. You might be showing quail eggs with brown spots, for example, defying their expectations. From a distance, they might mistake quail eggs for some insects, for example, because quail eggs are quite rate. 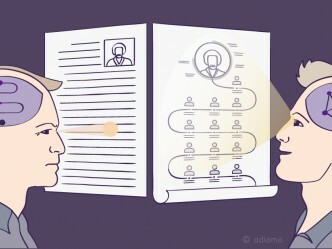 Since every infographic presents its own imaginary world to a reader, we have to test that other people will see our reality the same way as we do. The rules of visual perception tell us what not to do. They will not teach you how to create an infographic but they will help you not to destroy it. For most people not trained in art, these rules will not be intuitive. They are incredibly easy to violate if you do not know them. This is because art is not taught seriously in most schools as part of general education. So we cannot be surprised that most adults’ visual literacy is at a 5th grader’s level. Even very intelligent people might not notice gross design mistakes. This is nothing to worry about as long as you study these rules. They are quite easy to learn because all of them are visual. 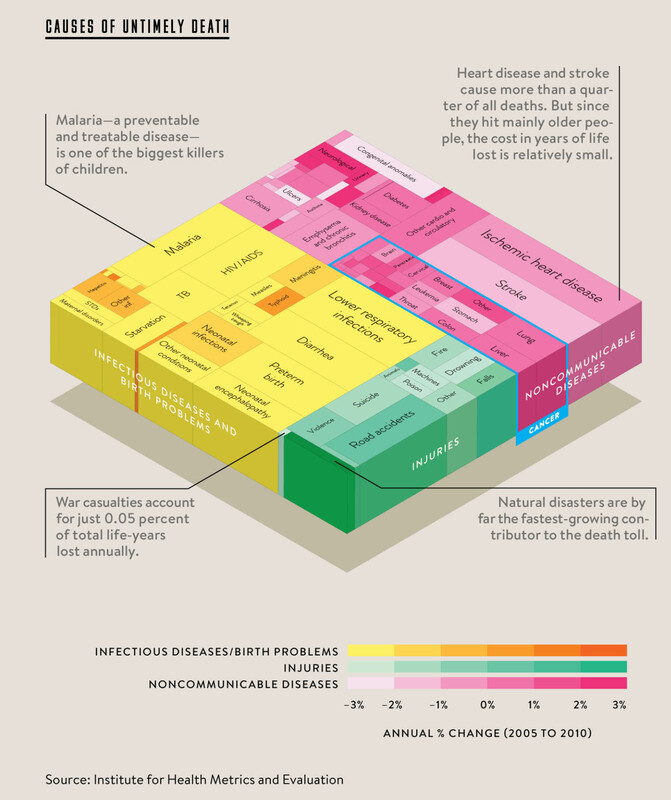 The doom and death of infographics is a popular topic of discussion. But infographics are far from dead. In fact, they are more alive than ever. The search interest for infographics has only continued to grow without interruption. The evolution of its definition, the rise in search traffic, the numbers of university courses on infographic design all point to infographics exploding in popularity. It is still day one. Today governments are already using infographics to tell citizens about the state of the country. In the long-term, this might lead to more transparency in government spending, simpler ways to apply for things, and track the effectiveness of government policies. The volume of data collected online doubles every year. Mining for insights in the growing volume of data will put new demands on infographics to show more information, more accurately, and with more meaningful and human insights. Data is the new oil but unlike an oil refinery that only needs to meet a technical standard of quality, you can mine data for meaning endlessly. There is a chance you will make the equivalent of the subway map of your industry. A sort of ever-green graphic that everyone in your field will know. There is a chance that you will visualize Wikipedia, or map the universe beyond its known borders, or maybe you can visualize the human psychology of self-doubt. Whatever your communication problem might be, it is quite solvable after all. Yes, it is not as simple as finding the right words or pretty pictures. It is about finding a balance between logic and emotion, accuracy and meaning, text and image, simplicity and complexity. If we knew what will be important tomorrow, this balance would be easy to strike. We don’t know. Tomorrow is a mystery. All we have is uncertainty about the future and a past to look back on. Because of this, the only type of infographic worth investing in today is one that will stand the test of time. An ever-green infographic. This kind of infographic shows objective knowledge that has long-term relevance. It is not about what matters now. It is about what always matters. For example, it is not about whether “you should raise startup funding for your seed round”. It is about “How Startup Funding Works” (my ever-green infographic). This brings us to the real reason why we are here, “here” as in “why we are here on this planet.” I hope it is not too presumptuous of me to say that you are reading this because you want your work to matter. Not just today, but also tomorrow. That you want to make something that lasts, and maybe even outlasts you. You are not alone in this desire. Timeless design is possible. We know this because we learned it from people who lived long before us. With this big picture in mind, maybe the curtain will drop, and we will see a solution for ourselves whether we are doing a multi-million dollar marketing campaign or starting a new blog. 2. 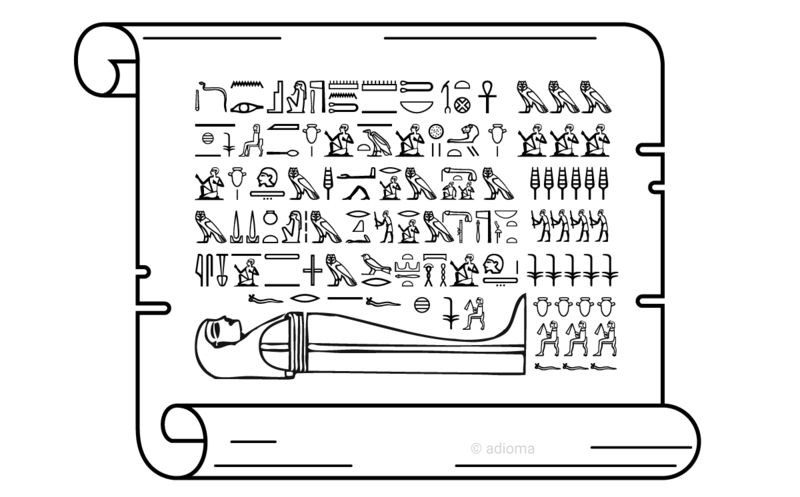 ^ An example of a design for the afterlife on slab stela of Nefertiabet. 3. ^ The story of how the alphabet became our “quick hack” that replaced visuals is fascinating. We think of the alphabet as a default, but it has not always been that. Today some people already communicate alphabet-free using only emojis, for example. 4. ^ This first world map is missing a lot of the world but it is the first map made based on an actual calculation of the Earth’s circumference. Even more interesting is Eratosthenes’ invention of the grid lines for latitude and longitude that we still use today. 5. 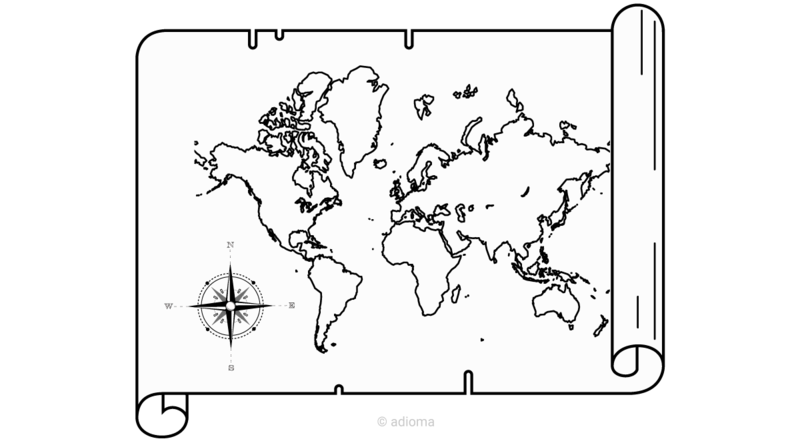 ^ The first scientific world map is missing still missing Australia, Antarctica and New Zealand, but it is a phenomenally rich map showing not just the continents and countries but the kinds of houses people live in, the trees and animal, the mountains, and the marine navigation routes. 6. ^ The world’s first bar chart looks a lot like the ones we make today. 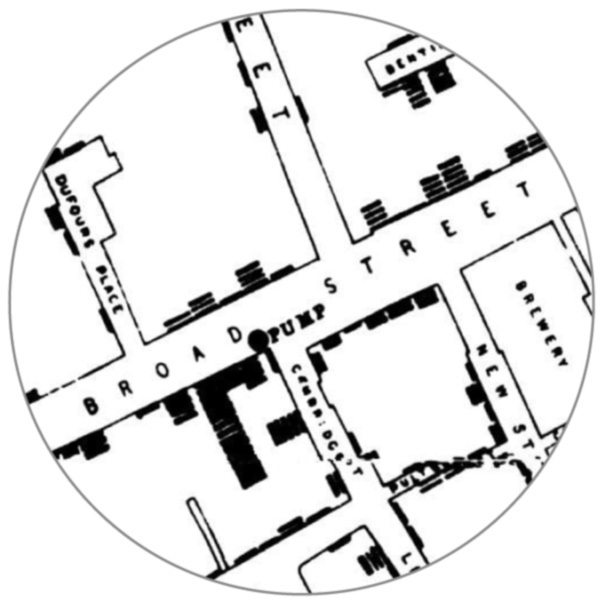 It was first published in The Commercial and Political Atlas in 1786. The first pie chart followed in 1801 in Statistical Breviary. 7. ^ See the English version of Minard’s map to appreciate its clarity. 8. 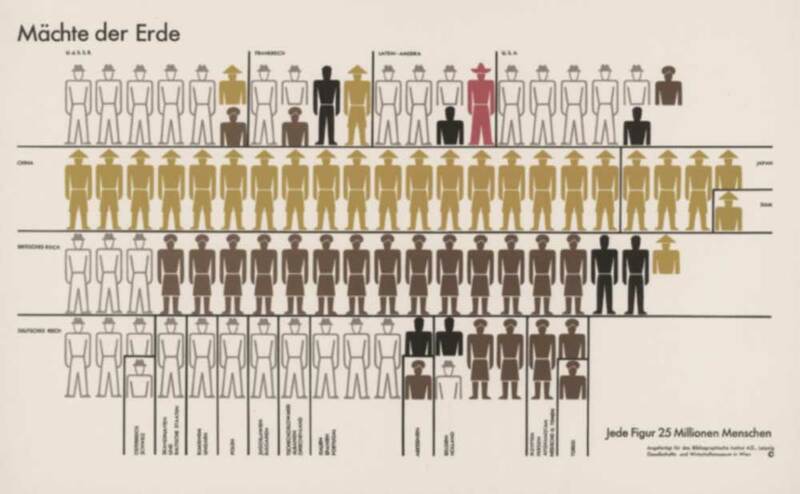 ^ How Neurath created thousands of symbols for Isotype not being a designer himself is a story worth reading. Isotype: Design and Contexts. 9. 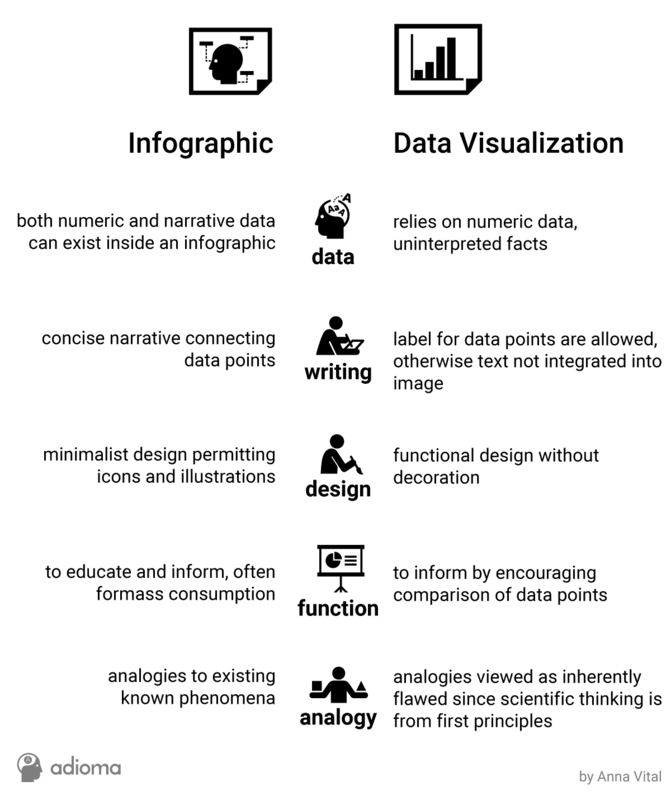 ^ I encourage you to compare the infographic schools of thought on both extremes of the data versus story spectrum. Edward Tufte is a statistician. He is the most data-intensive. David McCandless is a former journalist. He offers up data with a writer’s insight. Nigel Holmes is a long-time designer of explanation graphics, often with a funny tone to them. 10. ^ According to Google Trends the search volume for the word “infographic” started rising in 2010 worldwide. 11. ^ Luckily these design principles are not hard to learn, I recommend that you read the book by W. Lidwell, K. Holden, J. Butler The Universal Principles of Design. It explains each principle in one page, with illustrations for each. Please read it. It will open your eyes to how you see everything around you. You cannot outsource your design taste to a designer completely. 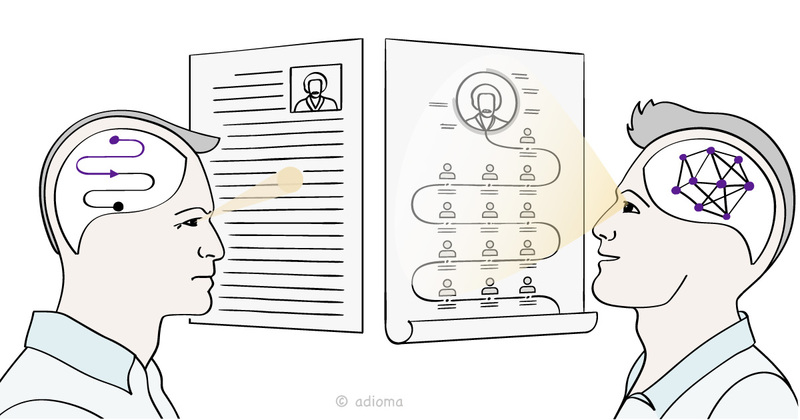 How can you judge if your infographic shows what you want it to show if you don’t know how other people will see it? You can’t intuit these principles unless you are an artist. 13. ^ This study measured the student reaction to the use of infographics in an anatomy class. The Pennsylvania Department of Education has a page promoting infographics to the public. Among the media companies making education-related infographics, Good Magazine does that best job in my opinion. 14. ^To get a feel of the growth in data collected worldwide, read this summary. Even so, infographics are expensive to make. At first, I solved this problem by becoming a designer. But for most people, finding a tool that makes their type of infographic is a better solution. As you saw, none of the people in this article were designers. For myself, I made an automated infographic tool, Adioma to speed up my infographic making. So please don’t get discouraged. Find the tool that you feel comfortable using, and focus on the meaning. This is the first article from the series “Learn Infographics” intended as a definitive guide on the topic of infographic definition, infographic history, and infographic types.